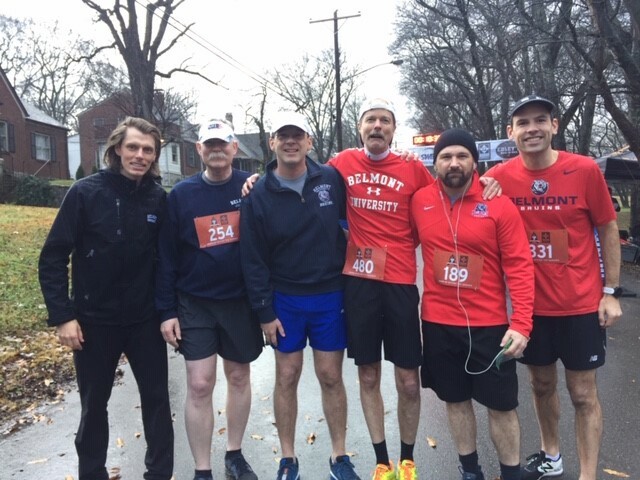 The Belmont University Corporate Challenge Team placed 1st in the “A” Division at the 12 South Winter Warmup 6k footrace on December 1. The 10-member Belmont faculty team competed against some of Nashville’s largest employers including Nissan, Genesco, Regions Bank and Bridgestone-Firestone. The 12 South Neighborhood Association’s annual event began in 2012 with 12- and 6k races staged before the neighborhood festival on the first weekend in December. This year’s race attracted over 600 runners. The beneficiaries of proceeds from the event were Hands on Nashville and the Waverly Belmont Backpack Program. Hands on Nashville connects volunteers to critical issues facing the Middle Tennessee community such as hunger, homelessness and environmental issues. The Waverly Belmont Backpack Program offers a weekend supply of nutritious meals and snacks for students completely free of charge to needy community members. The Belmont runners turned in some impressive times including Haskell Murray (22:10—5th place overall) and Kendall Shultes (27:45—3rd place overall).